Talloires is a former commune in the Haute-Savoie department in the Auvergne-Rhône-Alpes region in south-eastern France. Start off your visit on the 28th (Sun): look for all kinds of wild species at Reserve Naturelle du Bout du Lac and then get outside with Le Col de la Forclaz. For reviews, more things to do, ratings, and more tourist information, read our Talloires trip itinerary maker. Use the Route module to find suitable travel options from London, UK to Talloires. The time zone difference when traveling from London to Talloires is 1 hour. While traveling from London, expect a bit warmer days and about the same nights in Talloires, ranging from highs of 29°C to lows of 16°C. Finish your sightseeing early on the 28th (Sun) so you can travel to Annecy. Visiting Le Semnoz and Lac Leman will get you outdoors. 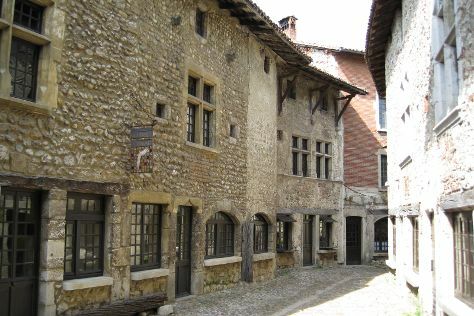 Explore hidden gems such as Cite medievale and Monastère Royal de Brou. You'll find plenty of places to visit near Annecy: Funiculaire de Thonon-les-Bains (in Thonon-les-Bains), Reculee de Baume les Messieurs (in Baume-les-Messieurs), Théâtre Du Casino Grand Cercle (in Aix-les-Bains) and Baumes les Messieurs (in Lons-le-Saunier). There's more to do: don't miss a visit to Pont des Amours. To find ratings, photos, other places to visit, and more tourist information, you can read our Annecy trip planner. The Route module can help you plan travel from Talloires to Annecy. Expect a daytime high around 29°C in August, and nighttime lows around 16°C. Cap off your sightseeing on the 2nd (Fri) early enough to travel back home.